Taking medication for anxiety and/or mood disorders is a very personal decision. As a practicing psychotherapist and psychiatrist, Saundra Jain, MA, PsyD, LPC and Rakesh Jain, MD, MPH frequently help their patients deal with these tough decisions. They have created a book of positive affirmations to assist those confronting this topic. The introduction includes a riveting personal story of a client who read the book, remembered her days of feeling shackled by depression, smiled and said,“UNLEASHED! Once I began taking anti-depressants my life was transformed.” The affirmations in this book provide a source of support and encouragement to anyone making a decision regarding taking a medication for anxiety or mood difficulties. Everyone knows that maintaining peak physical fitness is important to good health but what about your mental fitness? 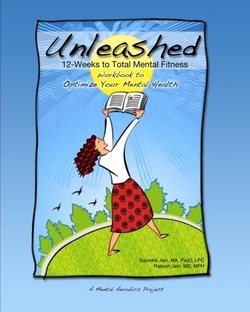 Have you every wondered, “Is my mental fitness in tiptop shape?” If not, then Unleashed: 12-Weeks to Total Mental Fitness is the workbook for you. The program is designed to strengthen your mental fitness just like an exercise program. There are 50 Mental Aerobics exercises to choose from including Promote Positive Thoughts, Be Proactive – Not Reactive, Manage Conflict Well, to name just a few. The chapters are short, easy to read and offer practical suggestions for each of the 50 topics. As a practicing psychotherapist and psychiatrist, Saundra Jain, MA, PsyD, LPC and Rakesh Jain, MD, MPH have created a user-friendly workbook to help those interested in strengthening their mental fitness. If you’re ready to boost your mental fitness, grab a copy of Unleashed and get moving!